OK, names of beaches? Vromolimnos, is pine-fringed, long and sandy. Platanias and Troulos are quite good, but a bit too popular. Agia Paraskevi, is a beautiful beach with golden sand and turquoise waters surrounded by trees 5,5km away from the island's town. It is an organized beach and it also has a beach bar. Now, Megali Ammos is an organized sandy beach right outside the town on the way to Koukounaries. Access is really easy so you won't have a problem reaching it. Then you may want to go for a swim in Agkistros, another beautiful beach in the southwestern part of the island. it is sandy, organized and has a snack bar. Where to go next? To Kastro! 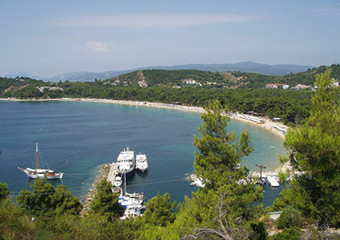 Right below the old medieval town of Skiathos is this beautiful beach. Combine a visit to the old town with a swim in the crystal clear waters of Kastro beach. This is one of the experiences that you shouldn't miss. Then, visit Aselinos, a bay with no view of land. Your eyes will only have a view of the clear blue sea towards the north. Although this one is a sandy beach, it doesn't look like the ones of southern Skiathos. Its sand is thicker, it has got many pebbles and its water is crystal clear but rather deep. The scenery is breathtaking! You can reach it by car following a dirt road or by boat. Moving on to Achladies, an organized sandy beach only 2km from town, which you will reach by car, bus or boat. Lalaria Beach is one of the loveliest beaches in Greece. Access is only by boat so chances are it won't be too crowded, but you got to bring food and water with you. It is full of small pebbles and it is situated on the northern part of the island. Xerxes Bay is usually uncrowded as well and it has a couple of decent tavernas. Kehries are two peaceful and attractive beaches, one small and one large, surrounded by hills. 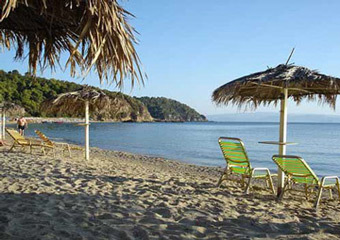 Agia Eleni Beach, finally, is an organized sandy beach with turquoise waters, popular to windsurfers. The most famous beach is Koukounaries, the best beach on the island, characterized by many as one of the most beautiful beaches of the Mediterranean sea. It is situated to the southwestern part of the island 13km from Chora. The beach is sandy with age-long pine trees and a magnificent sea. Whatever you do don't miss this beach. And last but not least I left one of the most popular beaches of the island, the famous Banana Beach! As the name indicates, this is a beautiful, well in fact three beaches, shaped as a banana, with soft yellow sand. 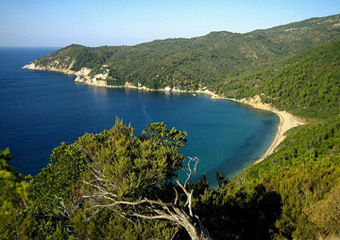 They are located in the south western part of the island only 30 minutes away from Skiathos town. Well as I told you before there are three banana beaches. The big banana also attracts non-nudists but there are some brave people who dare take their clothes of when the others are dressed. There is a cantina and sun beds. Then the other banana beach to the left of the big one attracts mainly nudists. There are sun beds and umbrellas but there is no cantina so you will have to buy anything you want from the cantina of the big banana beach which is very close. And finally there is the small or little banana beach to the right of big banana with a cantina and sun beds which also attracts nudists. Little Banana Beachis the one with the most crowd and it's popular with the gay and lesbian sunbathers as well. This place is definitely worth visiting, only for the uniqueness of it if not for any other reason. 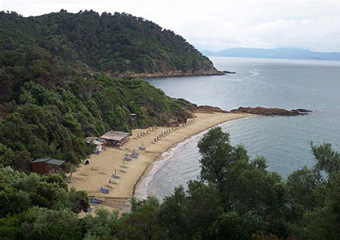 Bear in mind that these beaches are legal nudist beaches, the only ones in the island of Skiathos.